How to become a Professional Knitter - Robin Hunter Designs: Have you been Ma'am-ed yet? I think it's a right of passage, somewhere around our 40th birthday we stop being referred to as Miss and start hearing the dreaded Ma'am word. I know that most people claim that it is a sign of respect but the first time I heard it it was a bit of a shock. It told me that the perception of me to the rest of the world had just crossed a line and it was one that I wasn't sure which side I wished to be on. I like my life so it's easy to be happy about who I am right now and truly I do feel that there are many perks to being older and a lot less angst. My husband felt the same sense of discomfort the first time a teenager called him Sir so I know it's not just a sexist term more an ageist one. A few years ago a friend who is a little older than me gave me a some insight into how this perception of us by younger people progresses. She told me that she feels invisible, and generally disregarded as an old person. I suppose it's a reflection of our society at large. We had some ageism show up at the Knitting Guild I belong to a few months ago. A new member while complimenting the format of our meetings and the programming wanted to find the same thing but in a group with younger members. I had a great conversation about it with some of my knitting friends and the two youngest (one more than 20 years younger than me),didn't really see the new member's point. We also discussed the age of the guilds executive which is generally older than the average age of the members. I think this may be due to the fact that most younger women especially those with children simply don't have the time available to commit to the hours of unpaid volunteer work necessary to make the guild run. I like having friends of different ages as it adds to my experience of the world to hear how people at different stages of life feel about various topics.When I started thinking about it my friends have a forty year age range and I value them independently of their number of years on this earth. 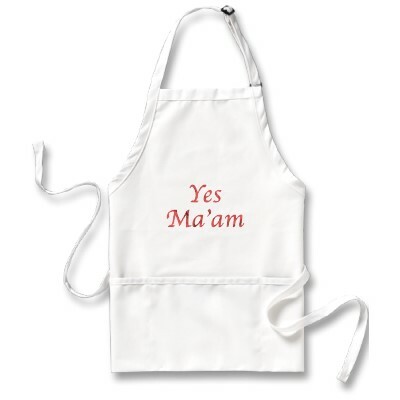 BTW, You can buy the apron here. The other side of the coin - since when did they start hiring mere children to be police officers/doctors/insert profession? If it makes you feel any better, my first experience with being ma'am was when I was 16 and dropping off a package at the post office. I am happy to say that because of my interest in the fiber arts I am lucky to have friends from 20-80 years old. My life is much richer from having such a variety of people in my life.